You are here: Welcome-to-KYOTO .com > The Gion Matsuri (Gion Festival) July 1-31 > “Shinkosai” of the Former Gion Festival. "Shinkosai" in the night of the former YamaHoko Junko. Since Gion festival is also a shrine ritual which is the same as the ritual held at most of shrines in Japan, Three Mikoshis (portable shrines on which the gods are seated) appear and "Mikoshi Togyo" is held. "Mikoshi Togyou" refers to a Shinto ritual where a Mikoshi (portable shrine) parades to get rid of infectious disease and pray for happiness of people. For the Gion Festival, this shrine ritual is called “Shinkosai”. Because of its large scale, the three large-size Mikoshies appear. And more the most characteristic thing of this ritual is the reason of "Yama Hoko"(the floats) cruise is to purify beforehand the path of the Mikoshis. Yes, it is. The "Yama Hoko Junko" which is the magnificent and graceful parade, is such as the opening act for the “Sinkosai” in fact. Praying for happiness of people lining the path, each Mikoshi parades its own route. And three Mikoshies finally gather together at the “Otabisyo” on Shijyo-Street where they stay till “Kankosai” after a week. The "Shinkosai", is completely different from the graceful "Yama Hoko Junko" taken place in the morning, is characterized by "Mikoshi togyo", which takes place in the evening, and is brave and thrilling. Till the "Kankosai", three Mikoshies stay in "Otabisyo" at Sijyo-Teramachi. 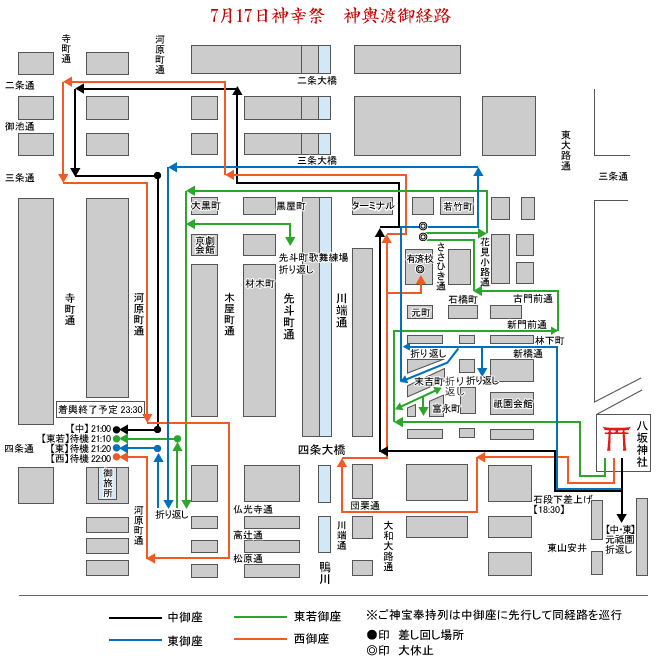 The root and time table of Mikoshi Togyo. "Kankosai" in the night of the latter YamaHoko Junko. Late last night three Mikoshis (Portable shrines on which the gods are seated) returned to Yasaka Shrine one by one in the darkness. The main reason of the Gion Festival - the custom of Yasaka shrine from the ancient times, the journey of extermination of infectious disease by God is about to end. The preparation began from the beginning of this month after various rituals and the former Yama Hoko Junko (Procession), the Mikoshis launched (Shinkosai). And after the latter Yama Hoko Procession was held purifying the path for the Mikoshis, three gods on the Mikoshis returned. At last the great mission has reached the end. Back to the former page.